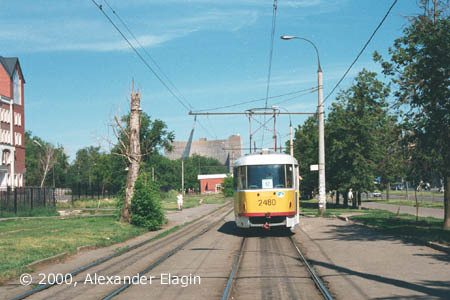 The line from Ostankino terminus to VDNKh is aligned mostly along Akademika Korolyova Street, and only two stretches of original alignment (3rd Ostankinskaya Street) that existed from 1953 to 1985 still remain. 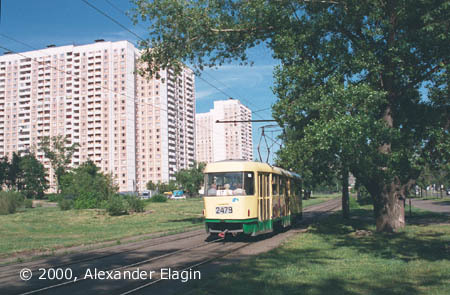 And before 1953, the line was located in 1st Ostankinskaya Street. 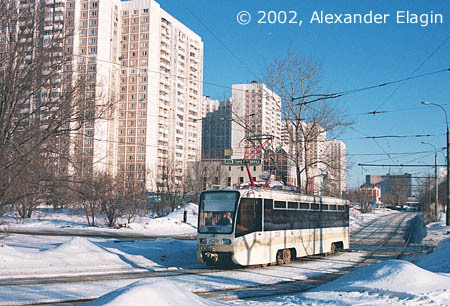 Trolleybuses replaced trams in that street in 1958, but also had left it for good a few decades later. Perhaps, that street is very unlucky for electric transit. 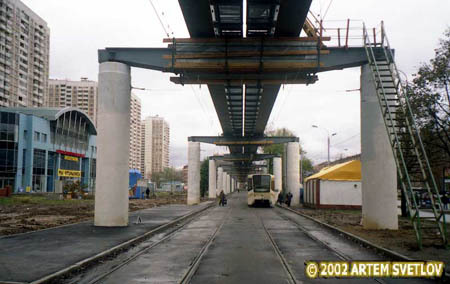 The tram tracks in 3rd Ostankinskaya Street - that part of the street that is located near Ostankino terminus. As there is no car traffic in this street, the tracks were covered with nice green grass - until the planned repair, when the tracks have been paved with standard dull slabs. 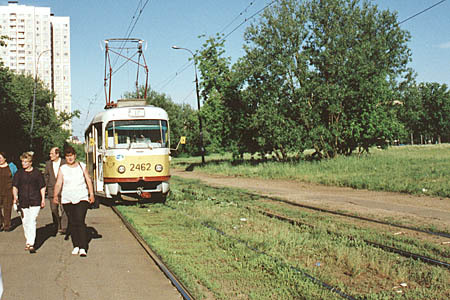 A gentle slope at the place where tracks cross a nameless road before turning to Ostankino terminus. The same slope seen ten months later. 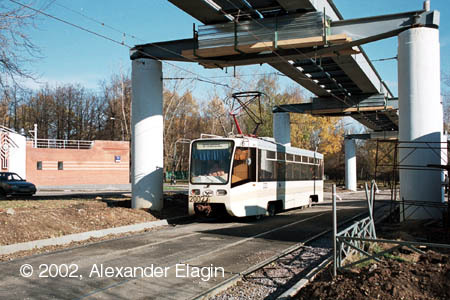 The cityscape has radically changed and tram tracks are now surrounded by monorail structures. 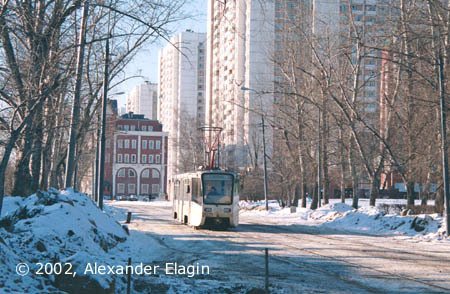 The line along Akademika Korolyova Street looked this way from mid-1980s (when it had been relocated from its previous location in 3rd Ostankinskaya Street because of construction of new apartment blocks seen in the distance) to 2002. Today the line looks very uncommon; it resembles a sort of a tunnel with those massive monorail supports. 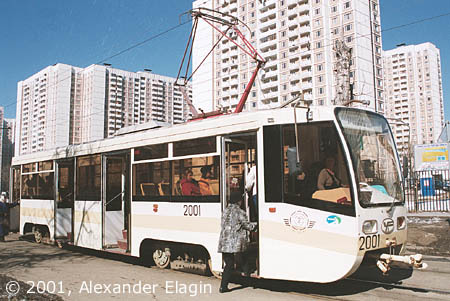 Ulitsa Tsandera tramstop. If you look attentively you will spot the broken tree behind the driver's cab. Unfortunately, the tree could not survive the monorail construction but it must be noted that constructors handled most trees with care during their work. 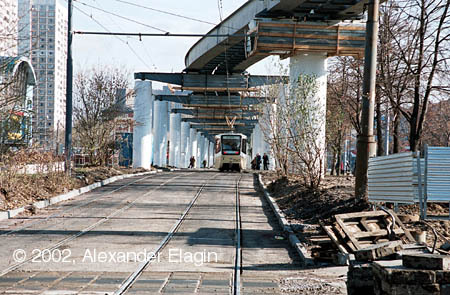 The same tramstop one and a half year later. The changes are obvious! 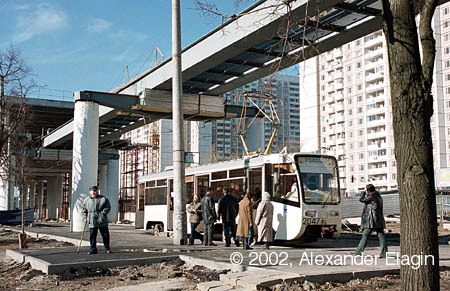 The line accompanied by monorail beams and supports diverts from Akademika Korolyova Street back to 3rd Ostankinskaya Street, where this KTM-19 #2002 has just came from. This is another part of "dual" 3rd Ostankinskaya Street, now between 6th Ostankinskiy Pereulok and 1st Ostankinskaya Street. No monorail can be seen in this January photo yet.